Alice Howe in the park with this reporter’s dog, always eager to insert himself into any photo shoot. At left, scenes from past farmers markets. WICKER PARK — The snow is melting, the weather is getting warmer and in a few short months, the Wicker Park Farmers Market will again set up shop on Sundays in the neighborhood’s namesake park. Last month, Alice Howe became the manager of the farmers market, replacing Hans Kumler, who now works as a program specialist for the Special Service Area Taxpayer District No. 33. We exchanged emails with Howe and asked her everything we pretty much want to know about the market (read our coverage from last season). What are the dates and times of the WPBFM 2018? 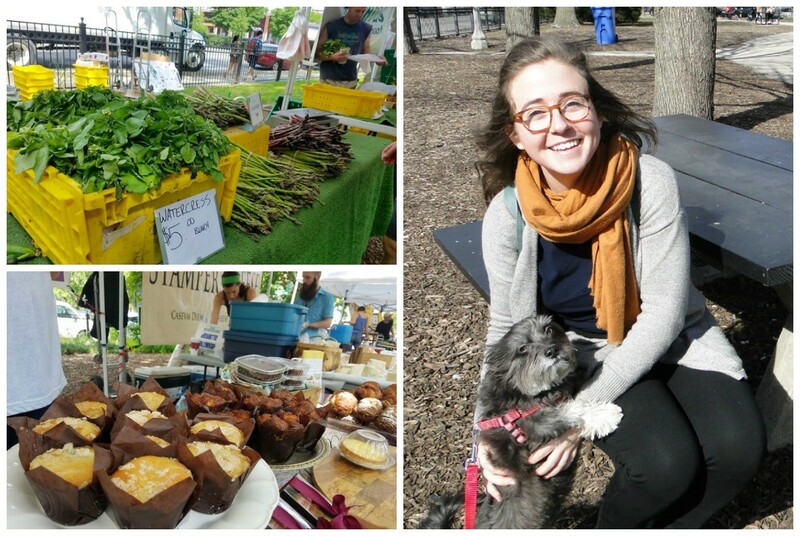 The market is every Sunday, from June 3rd — Oct. 28th in Wicker Park. The hours are 8 a.m. — 2 p.m. The market is located at 1425 N. Damen Ave. one-half block south of the CTA Damen Blue Line “L” stop. Bus riders can take the CTA №50 Damen bus to Le Moyne Avenue. 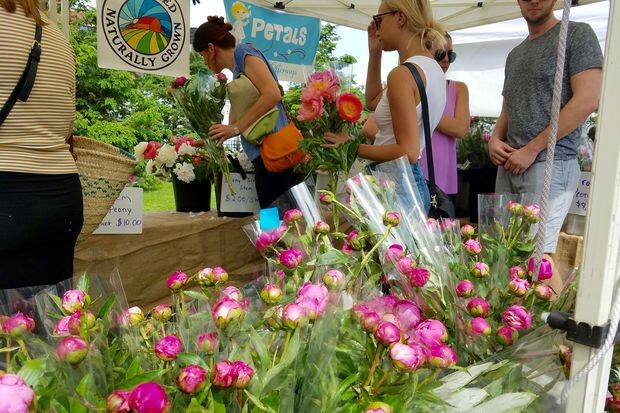 What does a farmers market manager do and when do you start planning for the season? 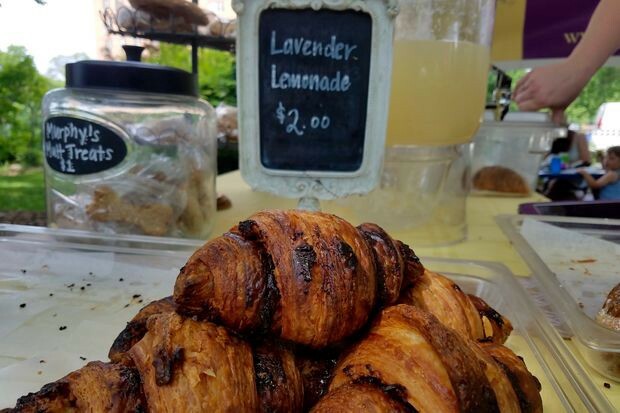 What makes the WPB Farmers Market special or different from other markets? 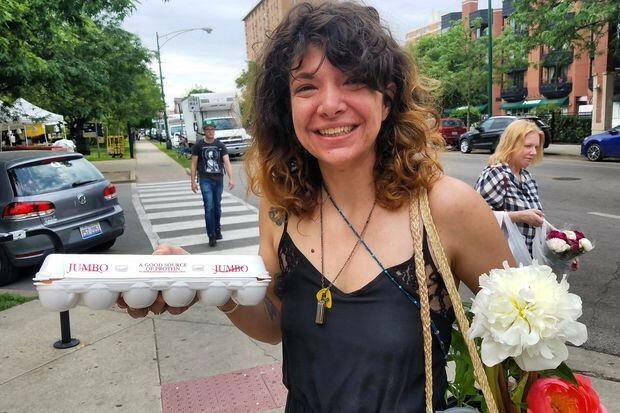 The Wicker Park Farmers Market offers a rotating community table for local businesses and organizations to distribute information. It’s a great opportunity to connect with the community. We are still accepting applications for this until April 9. How many vendors are you aiming to have on board this summer and are there any returning faces or farmers who’ve already committed to join that you’d like to mention? We are aiming to have a similar amount of vendors as last year, which was 25. We will definitely have returning faces this season including Nichols Farm, Seedling Fruit, and Mint Creek Farm, to name a few. I’ll be sure to keep our social media accounts up-to-date, so keep checking in! Where can potential vendors apply to be part of the market and what is the deadline for joining? Anything new that fans of the market should know about the upcoming season? We will be focusing on having more options for guests to eat at the market (such as prepared foods; previous summers have seen crepes, paletas and pies). We will also continue planning events and collaborations over the next few months, so stay tuned. How did you get the gig and will working early Sunday hours be tough for you? I began volunteering at the market last summer, a miracle happened and I was offered a job I’ve always wanted! And I’m currently working full-time as a barista [at nearby La Colombe] so I’ve quickly become a morning person. Any other WPFM fun facts you’d like to mention? We will be set up at the Wicker Park Bucktown Chamber of Commerce’s Wellness Expo and Rejuvenation Crawl on Sunday, April 8 at A.N. Pritzker Elementary School, 2009 W. Schiller St. I’d love to meet anyone interested in discussing the market or volunteering with us this season. 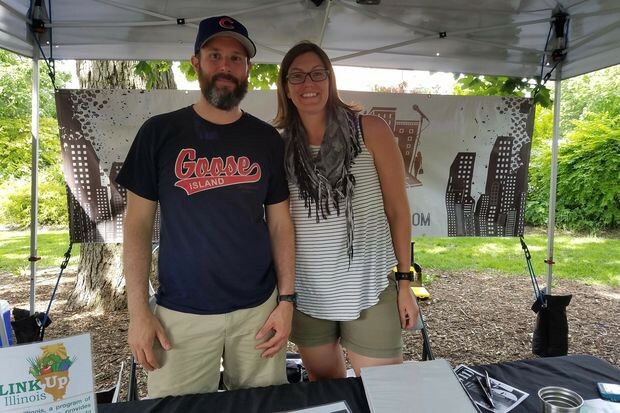 Hans Kumler and Pamela Maass from the Wicker Park Bucktown Chamber of Commerce, which organizes the market. 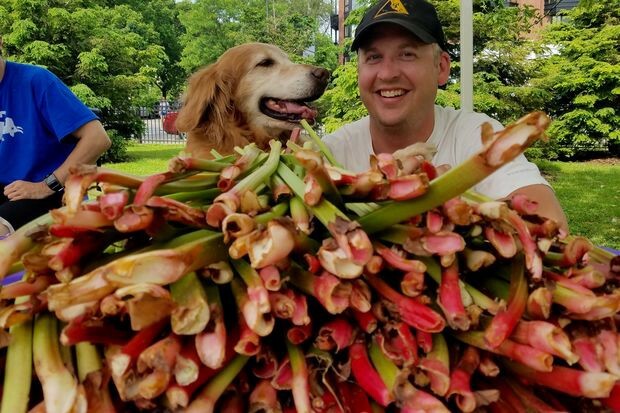 A seller, his dog and their rhubarb. Scones from a past market. a happy shopper from opening morning at last year’s market.